Nashville-based rock band The Redding Shift has yet to release a follow-up to 2009’s Where Did All The Virgins Go, but that doesn’t mean they shouldn’t still be on local music buffs’ radar. The four-piece ensemble fuses together elements of rock, blues, soul, metal and country to make their own brand of take no prisoners, full-throttle, amped-up rock and roll, which manages to carve out its own musical niche somewhere between The Black Keys and Soundgarden. The transplanted band members hail from multiple locales, (Ohio, New York, Massachusetts, and Alabama), but ultimately landed in music’s melting pot, Nashville, to fulfill their musical destiny during their search for fame and glory. The group is currently hitting venues all across Middle Tennessee, while playing multiple live gigs and working diligently to spread their hard-rocking sound all over Music City. 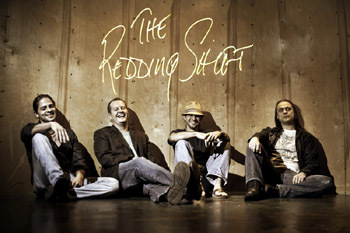 The Redding Shift’s idiosyncratic sound is anchored by lead singer Jason Spencer’s distinctively gritty, powerhouse vocals, which are backed by Mike Oberly’s inspiring guitar work, and Scott Bowen’s solid bass lines, are all held together by John Troutman’s robust drumming. The band sounds like it has the goods to deliver a noteworthy sophomore effort, which hopefully is already in the works. In the meantime, music connoisseurs who prefer their rock with some gusto can get a taste of the band’s electrifying sound by listening to their most recent key tracks including the grunge-like “Take This Life and Run,” the Zeppelin-esque “Ship of Fools,” and the bluesy “Rain,” among others on their artist page at ReverbNation. Nashville record execs and A&R types should listen up and take notice, because The Redding Shift sounds armed and ready to make a permanent and worthwhile mark upon rock’s ever-changing musical landscape. Audiophiles should check out the band’s scheduled live gigs and download tracks for free at reverbnation.com/thereddingshift.